Performative installation 1,80 m x 10 m. Material 70 denier Nylon Taffeta. 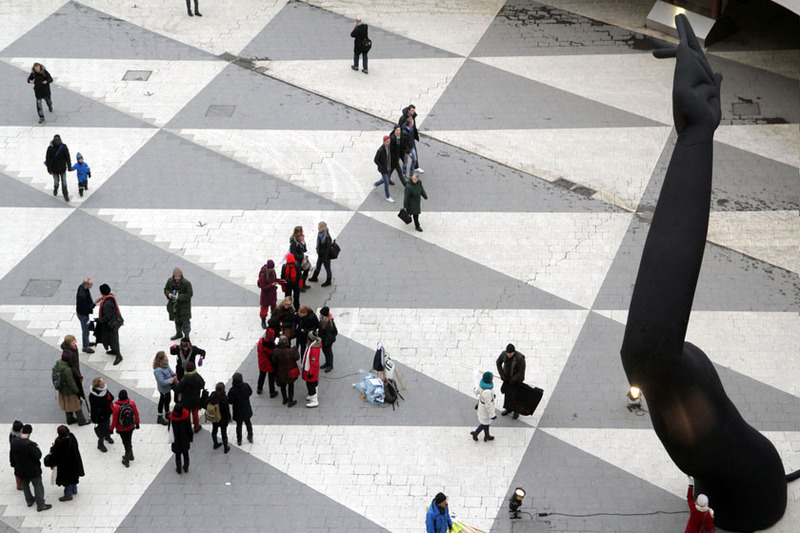 Urbano’s work, Oscillating absence brings an animated monument into one of the most coded public spaces in downtown Stockholm. Sergelstorg, with its iconic black and white flagstones, visually communicates the city center: busy, resolved, highly designed. In this context, Urbano’s 10 meter sculpture, modeled on her own arm, juxtaposes defiance with hesitation. This piece has been shown in downtown Miami as well as in the peaceful Engelsberg Skulpturparken, yet adapts to each site, commenting on its surroundings even as it shifts them. Its scale makes an immediate impact as does its expressive intervention into the urban landscape. This chameleon-like flexibility evokes much of the thinking around the creation of the piece and of other elements of Urbano’s work. In her practice, she focuses on adaptability and hybridization: the constant flux and tension of the individual in the public sphere. A temporary intervention, the sculpture navigates the grey zones between empowerment and self-expression. When is one permitted to take up space, how and in which contexts? Where, if at all, is there space to reveal weakness or doubt? Where can one reveal these sites of tension and flux? Urbano interrogates restrictions, playing with multiple visual codes. A reaching, bold gesture on an immense scale that falters, allows itself to hesitate before rising again to dominate the space. The potentiality of the raised arm’s violence is negated by the grace of its movement, the delicacy of its material: a reluctant, fragile monument able to show weakness publicly. This action of the work takes on even further layers when seen within Urbano’s engaged practice that discusses issues of intersectional identities, belonging, gender and liminality. A subtitle to the work, ‘a silhouette has no race’, reveals the conflicts innate within articulating positionality on this scale: the silhouette being dependent on the external conditions that shift and transform the representation of the original. When read as a portrait of Urbano, Oscillating Absence communicates the challenges of navigating multiple social realities and expectations projected externally. A frequent expectation for women of colour in the art sphere is to embody strength and a persona of surmounting obstacles. Performing this identity within the public sphere on a monumental scale, Urbano subverts those expectations by having the arm reach towards the people pouring from the subway. The piece stands its ground in the public sphere only to falter and deflate for a minute, then resolutely regain its form and reach toward the people again. This choreography of power and doubt allows for a more nuanced and complex articulation of Urbano’s personal experience within a limiting socio-political context of imposed expectations. This entry was tagged installation, Migration.